Safeguarding refers to the proactive approach to keeping children, young people and adults at risk safe from harm. 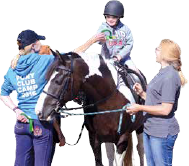 RDA places the highest priority on safety and enjoyment, and recognises that it has a duty of care to those taking part. To ensure this, RDA UK and its member groups are committed not only to protecting those who use their services but also to promoting their welfare by taking all reasonable steps to ensure risks of harm are minimised. The welfare of children, young people and adults at risk are paramount and they have the right to protection from abuse. It takes all reasonable, practical steps to protect from harm, discrimination and degrading treatment. All concerns and allegations of poor practice or abuse are taken seriously and responded to swiftly and appropriately. 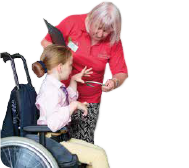 All RDA member groups sign up to the RDA Safeguarding Policy. All employees and volunteers are carefully selected, informed about their responsibilities and provided with guidance and/or training in good practice and safeguarding procedures. Everyone knows and accepts their responsibilities and works together for the safeguard of all involved.